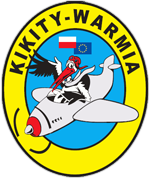 Welcome to Kikity - the Poland's first AERO-AGROTURISTIC place! Kikity airstrip is placed between clean, Mazurian lakes and fragrant forest. It is a great place for spending your free time alone as well as with whole family. Try us - we are sure, you will come back! beautiful landscape - you can enjoy it from the air or ground.